Hello and welcome to the November Devlog guys. It's the 30th day of November when I post this but I'm already working on it last night. So, November. While I might sound really cheery in the beginning, this month is not really the most productive one I've had. It had not been that kind to me as well. Once again, life happened and I'm barely staying afloat for now. Ahem, anyways, let's talk about my progress for this month. To start with, November is the National Novel Writing Month or Nanowrimo as well so I decided to join the first week where everything was still positive and all. I worked on my wordcount for Nanowrimo while adding some words to TV:S.
But then, the first week of November puts me on a rough spot and I just... I stopped working on TV: S Chapter 3 completely. I felt down and I just can't work on it then. Instead, I just worked on my Nanowrimo because I was planning to finish it this year but my output wasn't really great. I wasn't satisfied with whatever I'm doing and I just feel... numb. Something positive did happen, I got a second chance somewhere but that first week still affected me so much that I haven't opened TV:S. I didn't want my output for TV:S to suffer so I stopped because it seems the logical thing to do for me at that time. So... yeah, life happened again and I know I'm being vague with the whole story but that's about it in the condensed version. As for what I did accomplish this month, I started the 3rd Half for TV: S before I stopped and I got at least 1k words in. That's about what I've done for most of the month so I ended up breaking my supposed 'Don't break the chain' mantra. So, I just used this month for self-care, it's the least I can do so I can go back to the drive of things (Regular Show saved me this month and it's now officially my favorite cartoon xD). I did get to work this week but I only focused on transferring the updated Prologue, Chapter 1's epilogue, and Chapter 2 to the Ren'py script. In this way, I can at least get some stuff done while I'm waiting to get the drive to write again. For the prologue, I managed to finish it (yay!). Anyways! I started transferring Chapter 2 and that would be most of what I'm doing on the last day of November. 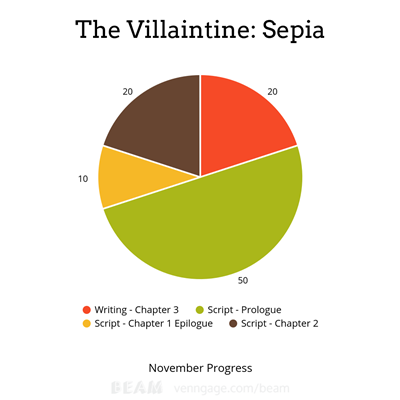 By December, I'm going to finish the Chapter 2 script for now and try to get my drive back to continuing Chapter 3. I don't know... it's like Chapter 3 is always something crucial for games or VNs, like it's the chapter that can actually make or break the game so maybe that's why I'm having so much trouble with it. 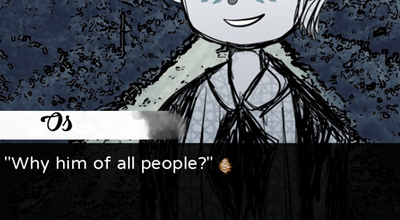 Lastly, I finally decided to make the epilogue a true end indicator so that's that and while this whole post seems down, I'm not giving up on TV:S yet. I'm still going to work on it and I'd keep you updated next month. 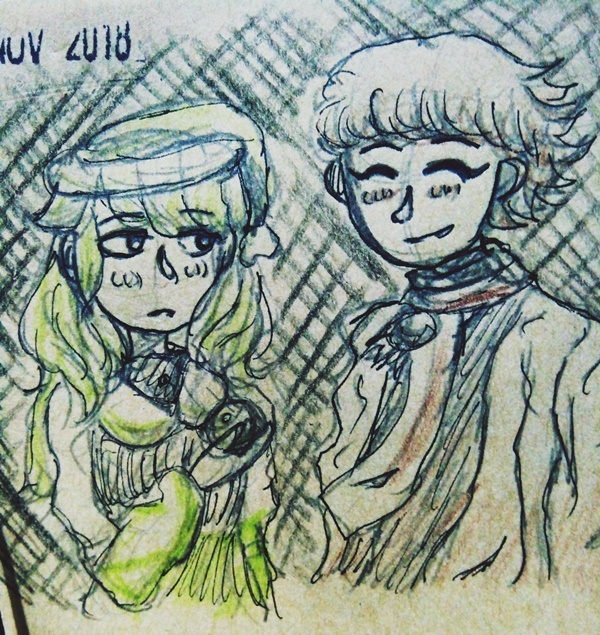 To those who are still looking forward to The Villaintine: Sepia, thank you so much and stay awesome :D And as an extra, have this mini doodle I have for the Princess and the Villain for early December. See you next month! Hey~ Thanks for your kind and encouraging comment. 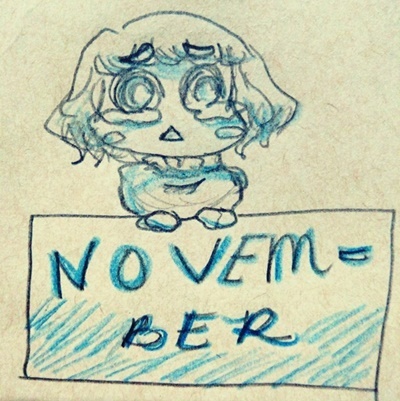 Yes, November haven't been nice but December's starting and more hopes for this month. Anyways, yes, Regular Show is the best! I only started watching the show on November and can't get enough of it that I practically finished everything plus the movie this month. It's just arghh xD the best!